The CABINDA is a state located in Central Africa, bordered on North by the Republic of Congo, on East and South by the Democratic Republic of Congo, the last border, being the Atlantic Ocean itself. The logical consequence is : from Miconje to Ièma and from Massabi to Nzenzé de Lucula, CABINDA is Territorial Entity recognized by the 1933 Constitution of Portugal, distinctively from Angola which is a former Portuguese colony, since the XVth Century. Therefore, it is obvious that CABINDA is really a State, and not an enclaved province as it is commonly believed. Objectively, CABINDA has no common border with Angola, a country which is occupying militarily and illegally CABINDA. Today, the Cabindese Refounders of the F.L.E.C. called their popular uprising the Front of Liberation of the State of CABINDA (F.L.E.C.). The Resistants refounding CABINDA settle their actions on the basis of the International Rights which autorise any Tenitory illegally occupied to submit their case to the United Nations Organization ( O.N.U ), although it is not a Member, as clearly stipulated in the articles 33 and 34 of the UN Charter. In 1964, the Organization of African Unity ( U.A ) classified CABINDA as the 39th State of Africa to be decolonized. CABINDA is one of the richest country of the continent with sweet water. The most important river is Chiloango River, the others are located in the Mayombe. CABINDA which is located on the equator's a tropical climate with two seasons : from May to September, the dry season, and from September to April, the rainy season with high température and humidity. However, on the seaside, trends are as follows : high températures and high rain ratio, with equatorial tendencies; wet weather with moderate températures. The population number is 600,000 inhabitants, based on the last census in 1995, taking no account of the Cabindese people living abroad : approximately 400,000 citizens. Main urban centers : Tchiowa, Landana, Buco Zau, Belize, Malongo, Malembo, Massabi, etc. ..
Forest : huge resources in various species. Fishing : abundant fishing coastal areas on many kflometers. Games : large varieties of wild animals of the african savannah : elephants, lions, buffaloes, etc... and also exceptional species such as black antelopes and hippopotamus. Agriculture : fertile lands allow large varieties of cultures such as, coffee, beans, bananas, manioc, fruits, vegetables, potatoes, etc. The present Charter settles a popular uprising for liberation calied "Front of Liberation of the State of CABINDA", F.L.E.C. The duration of F.L.E.C. is unlimited. The CABINDA and the F.L.E.C. 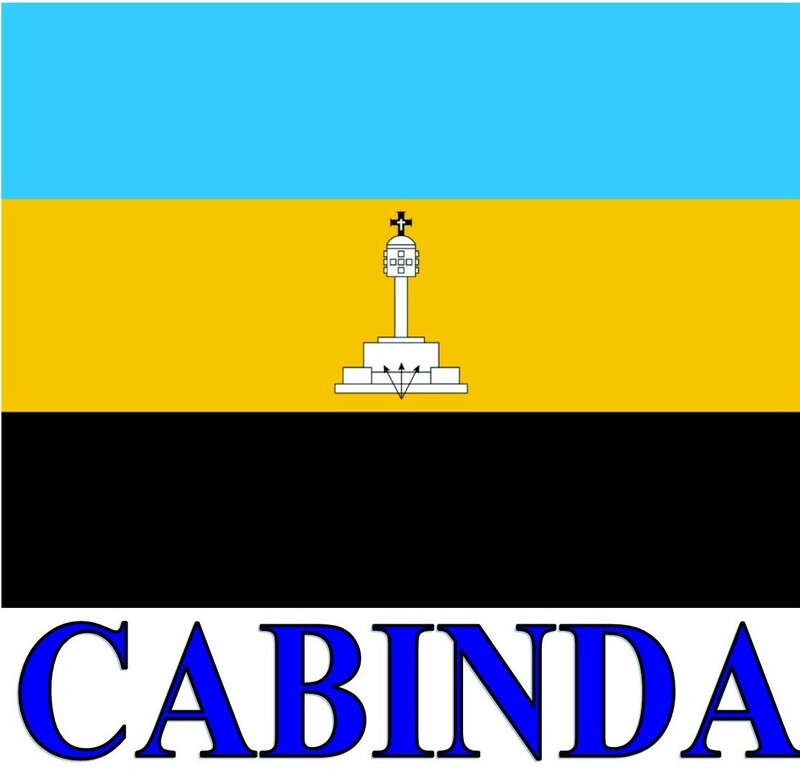 National Flag is blue, gold and black, with, in its center, the logo representing the monument of the Treaty of Simulambuco (signed between Portugal and CABINDA in 1883/1884/1885). F.L.E.C. is a democratic association where any Member is allowed to talk constructively in order to contribute effectively to the right management of the association until final victory. The F.L.E.C. 's main object is the struggle for liberation by diplomatic means, because of the overwhelming armaments of Angola on our National Territory and as a consequence of the awake of consciousness of the Cabindese People to claim their Human and Citizens' Rights in their national Territory. The mission of our army of liberation is to defend our country as soon as it is necessary, beside diplomatie means on which we settle our present struggle, also the enemy is over-armed; the army could start any counter-stroke against the occupants without warning. - Military Zone n°3 will be reserved to the Naval Forces. The F.L.E.C. is founded on the principles defined by the Universal Declaration of the Human Rights and the rights of the Citizens. Solidarity between Cabindese Citizens living in free areas and between refugees living in neighboring countries, in misery and forgotten by the rest of the World. The F.L.E.C. is open to any Cabindese or aliens who adhere to the present charter and to the strategic objectives of the association. Any Cabindese Citizen is entitled to hold a Cabindese National identity Card. The F.L.E.C. is composed of Active Members, directly affiliated, Members of Honor and Fellow Associates. a) Active Members are part of the basic structures, they adhere to this Charter and actively contribute to the struggle for the Independence of CABINDA. They regularly pay their Membership Fees. b) Members of Honor : this title is dehvered by the Committee of Directors to some Very Important Persons according to criteria defined by the Internal Rules. Members of Honor may participate to all activities and may vote. c) Fellow Associates do not participate actively and regularly to the F.L.E.C's activities ; however, they hold a Membership Card delivered by the association. They may neither vote or be elected in the various departments of the association. Any Adhesion Request must be formulated in writing by the Applicant. Admission of new members are decided by the Committee of Directors who are not compelled to explain their decision in case the request is rejected. Any Member agrees to respect the Articles of this Charter which are communicated to him upon his effective adhesion. - Any other donation and legacy. Fees are deterrained annually the Committee of Directors, both for active Members and Fellow Associates. Forward to the Committee of Directors any information he should have. Dismissal of Member is pronounced by the Committee of Directors for repeated and non justified payment of Membership Fees. Before any eventual decision of dismissal or exclusion conceming a Member, he vàll be invited to provide written explications to the Committee of Directors . No Member of the Association could be considered as personally responsible for any commitments made by the Association. No Member of the Association could commit himself for the Association without a warrant of the Committee of Directors. 4. The Congress, the Committee of Directors or the Government. The Congress is the highest organism of the F.L.E.C. Ordinary meetings are held every three years. Extraordinary meetings could be held according to the circumstances. Then, the decision to call for an Extraordinary Congress taken by the Committee of Directors of the Association, with a majority of votes of two third. The Congress will settle the Questions of the Day of the meetings and will inform all the F.L.E.C. 's federations four months before the date of meeting. - Members of the Committee of honor. The Delegations of the Federations are consisting in the Members of the Federal Committees and of the Delegates elected by each Federation during a preparatory Convention before the Congress. Any Member attending the Congress hold one vote. Vote ballots are secret. All Congress decisions are taken by the majority of Members' votes. Vote ballots are secret. - And, at last, taking any necessary decisions, with general means, to insure the good management of the Association for its struggle. The Congress' decisions apply to any Departments of the Association and its Members. Any transgression of the Charter, or of the Program of Action, or the decisions, or the general orientations, or the Internal Rules, and more generally speaking of any fondamental principle or any detrimental attempt or breaking to the Union or any will be punished in conformity with the Internal Rules. Before punishing a Member of the Association, it is compulsory to inform him for what offenses he could be blamed. He must be informed one month before the meeting. If the Member of the Association does not present his arguments by writing within one month the Committee of Directors could take any appropriate decision. However the Member could appeal on the sentence and the Congress must examine the case again. Only the Congress could exclude a Member of the Committee of Directors (Govemment) . Any Mernber convinced of Treason will be radiated from the the Association. At CABINDA's independence, he will be tried by a Cabindese People's Tribunal. The Congress only may decide to revise or modify the Charter. However, the dissolution of the Association will not be possible as long as CABIMA is not free and independent.